Have you ever walked into your yard and found a giant caterpillar??? If you did would you say hello? Or invite him inside for a game of chess? 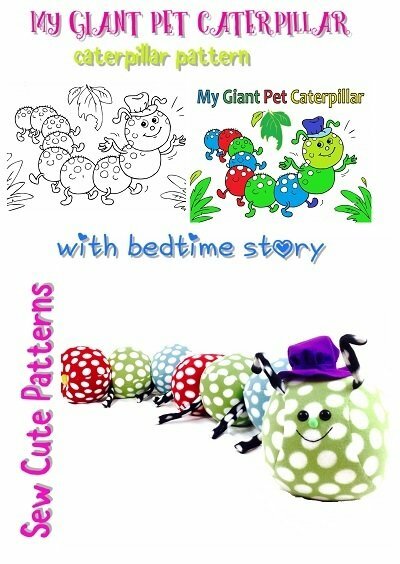 Read the story of My Giant Pet Caterpillar to your children and grandchildren and find out what's it like to have one as a pet! When you're finished reading the story, you can use the pattern to make your own customized giant pet caterpillar from the story. Pick the perfect fabric in your children's favorite colors to make your new pet come to life! The story is told in a fun 28 page coloring storybook to make it even more fun and interactive. Kids can color and design their own storybook. The giant caterpillar makes awesome kids room or nursery room decor! - 1 PDF sewing pattern with instructions and pattern pieces to create a 63" long plush caterpillar and the hat. Each body part and head is 7" long. - Letter templates to personalize the caterpillar. And your child's name to make it even more special. For more information about this pattern, visit our blog!